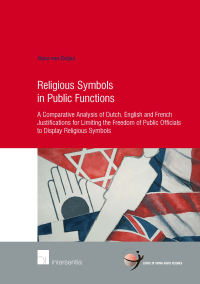 This month, Intersentia Publishing will publish Religious Symbols in Public Functions: Unveiling State Neutrality: A Comparative Analysis of Dutch, English and French Justifications for Limiting the Freedom of Public Officials to Display Religious Symbols by Hana M.A.E. van Ooijen (LL.M, Utrecht University). The publisher’s description follows. Religious symbols are loaded with meaning, not only for those who display them. They have generated controversy in many circles, be they religious or secular, public or private, and within or outside academia. Debate has taken place throughout Europe and beyond, at times leading to limitations or bans of religious symbols. While this debate might seem whimsical in occasional flare-ups, it merits closer scrutiny, precisely because it is part of a long-running debate, it crosses boundaries and because it touches upon larger underlying questions. This book singles out a particularly contentious issue: religious symbols in public functions and it focuses on the judiciary, the police and public education. It is often argued that public officials in these functions should be ‘neutral’ which consequently implies that they cannot display religious symbols. This book aims to unravel this line of thought to the core. It disentangles the debate as it has been conducted in the Netherlands and studies the concept of state neutrality in depth. Furthermore, it appraises the arguments put forward against the background of three contexts: the European Convention on Human Rights, France and England. It critically questions whether state neutrality can necessitate and/or even justify limitations on the freedom of public officials to display religious symbols. Although this book is the result of an academic legal study, it can be read by students, academics, professionals, or anyone interested in the issue of religious symbols in public functions.